Christmas brings many things to our lives including decorated pine trees, twinkling lights, and Mr. and Mrs. Claus. Christmas in Sarasota means parades, events, and activities as well, and, in recent years, a new type of fun, festive event has emerged: ugly Christmas sweater parties! If you need a reason to don an ugly Christmas sweater this season, check out these ugly Christmas sweater parties in Sarasota and make them a part of your annual festivities. For those of you who love all Christmas parties, this ugly Christmas sweater party is the pre-party to all of the events this holiday season. On December 6, head over to the Dynasty Dance Club in Sarasota to get yourself in the Christmas spirit. 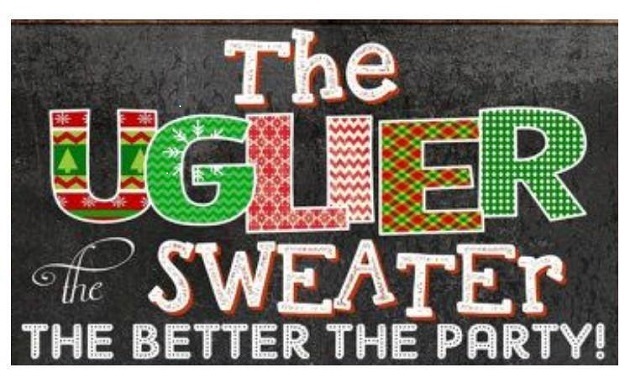 Unwrinkle the ugly sweater you’ve had in the closet for a year and prepare for all of the festivities to come! Join in on some holiday activities like dancing to traditional holiday music. Admission is $10 per person or $15 per couple. On Wednesday, December 19th, wear your ugly Christmas sweater to the Siesta Key Oyster Bar on Siesta Key and participate in their contest and enjoy specials drink specials from 5-11 p.m. $5 Kettle One all day on Wednesday, prizes, raffles and giveaways from Miller Lite and Sierra Nevada reps from 5-7 p.m. Live music from the band Kettle of Fish from 7 - 11 p.m. This festive bar crawl invites anyone 21 and older to break out their ugly Christmas sweaters and head over to walk along Main Street on December 8 for Christmas festivities as well as great food and beverages. Many Sarasota shops, restaurants, and bars will have discounts for all crawlers. Registration starts at Evie's Tavern & Grill on Main St. where you'll receive a complimentary Santa hat, koozie, and a shot to get you started. Pay $20 for a VIP ticket and you also receive an Ugly Sweater Crawl t-shirt to commemorate this fun night. On December 22 at 6 p.m., Showfolks of Sarasota will be hosting their annual ugly Christmas sweater party. Wear your ugliest Christmas sweaters and enjoy partying with other locals from the Sarasota area while Frankie Rode provides the music. These ugly sweater Christmas parties bring a festive spirit to Christmas in Sarasota. Find that ugly sweater of yours or buy a new one and embrace the tackiness while you wear it at one of these adult holiday parties. Find more events in Sarasota year-round by registering on 941area, your free guide to the Sarasota area.